When there were clouds of uncertainties that who would broadcast the matches live in India, Star Sports against sneaked in to provide great quality telecast and streaming of India vs Bangladesh series. Thanks to them we are able to watch the matches live at our comfort live on TV or on the internet. Fans in India can enjoy India vs Bangladesh 2nd ODI live streaming and telecast on Star Sports in English as well as Hindi commentary. Let us have brief look at what happened in the 1st ODI. Bangladesh skipper Mushfiqur Rahim won the toss and elected to bat first. Promising Tamim Iqbal went back to pavilion without troubling the scorers. Anamul proved his worth with 44 runs from 60 balls. Mominul failed with just six runs. Skipper played a blistering innings of 59 runs from 63 balls. Shakib yet again proved his batting consistency and scored a fifty. Mahmudullah scored 41 and Nasir helped him with a helpful 22 runs innings. Bangladesh managed a decent total of 272 at the loss of 9 wickets. Umesh Yadav was the pick of the bowlers for India with three wickets. Mohit Sharma unfortunately didn't complete his quota of ten overs. He just bowled 5.4 overs and went on and off the field. His fitness is a concern for the team now. Four other Indian bowlers clinched wickets - Mishra, Akshar Patel, Rasool and Raina. In return, India got a decent start with first wicket falling at a team score of 99. Uthappa was sent back to pavilion on a score of 50. Rahane managed better with a score of 64. Pujara didnt score any while Rayudu and Raina took India to victory based on Duckworth and Lewis method. India scored 153 in 24.5 overs and won by 7 wickets with 7 balls in hand. Shakib Al Hasan took two wickets. Rahane was awarded man of the match. 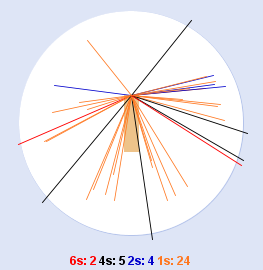 Here is Rahane's wagon wheel. He has managed to score runs all over the park. Bangladeshi bowlers would certainly have an eye on him in the 2nd ODI match. India has a long batting line up and Bangladeshi bowlers would need a mammoth of efforts to get through this line up. In terms of a good start, Bangladesh needs to get good runs from the openers. A flying start of above 6 runs per over at least till 15th over can give them a confidence of big score to defend. Bowlers are doing a good job especially if one has good pace like Umesh Yadav or good sensible spin like Shakib or Mishra. Rasool was impressive and he would love to clinch more wickets in the second ODI. Stay tuned for more updates as India takes on Bangladesh at Mirpur in 2nd ODI on 17th June 2014.